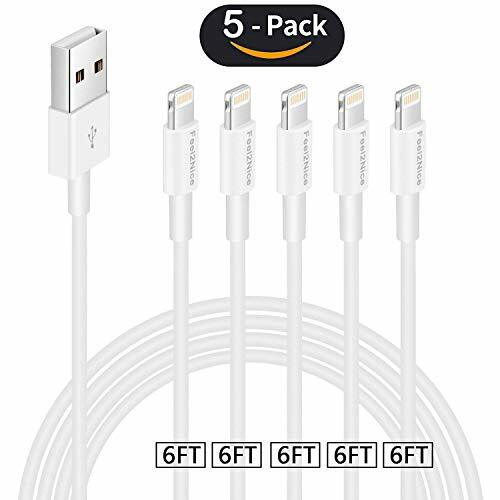 Iphone charger cable 6ft,Feel2Nice 5 Pack 6 foot lightning charger cord for iPhone X 8/8 Plus/7/7 plus/6s/6s plus/6/6 plus iPhone 5/5s/5c/iPad, White | Replicafer Co.
6FT long enough for many occasions, charging your devices in bedroom, sofa, kitchen, car and office with much less restricting on the length. 100% compatibility to transmit data stably and charge fastly without error messages. If you for any reason are not satisfaction by Feel2Nice, please do not hesitate to contact us and We will do our best to solve your problem asap!At Feel2Nice we take full ownership and responsibility for the quality of our products. It comes with 1 Year Worry-free Warranty and full support from Feel2Nice, so you can purchase with confidence.